What goes in your mouth stays in your body, even if you don’t swallow it. Nancy Rosenzweig, president of The Natural Dentist, says your mouth and gums absorb ingredients and are a superhighway to every system in your body. Not only are your gums able to absorb oral bacteria, they can absorb chemicals that are in your toothpastes and mouthwashes. Having a healthy mouth can actually help safeguard your overall health. 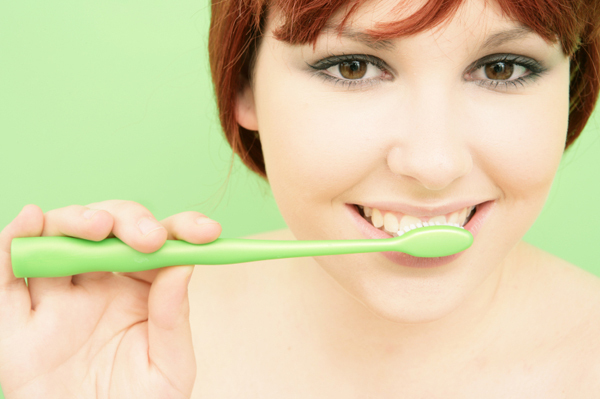 So shouldn’t you be using the healthiest products for your dental hygiene? Here is the truth about natural dental products. She warns, “Your teeth can be filled, patched, straightened and whitened, but gum disease weakens their foundation. If left uncontrolled, gum disease can progress to tooth loss.” If you take care of your gums, you will be taking care of your teeth. The Natural Dentist wants you to have a healthy mouth and has the perfect line of natural dental products to help you get the most eco-friendly smile possible! Here is why you should be using natural dental products. What are the advantages of using natural dental products? Axe the alcohol. The leading brand of mouthwash on the market contains a high percentage of alcohol (21 to 26 percent), meaning your morning swish could be 50 proof! That is more than some alcoholic beverages – beer averages 5 percent (10 proof) and most wine contains 12 percent alcohol (24 proof). And you won’t miss that characteristic burn you get with regular mouthwash. The Natural Dentist mouth rinse contains aloe vera gel and coconut oil, which help to soothe mouth and gum tissue. Do away with dental detergent. Do you want detergent in your mouth? According to Rosenzweig, sodium lauryl sulfate (SLS), an ingredient found in regular toothpastes, is a detergent that makes toothpaste foamy. Avoid additives and preservatives. You avoid artificial ingredients in your food, and you can now avoid them in your oral care, too. Rosenzweig warns that regular toothpastes and mouth rinses contain artificial additives such as Blue #1, Yellow #5 or other FD&C colorants, saccharine, benzoic acid and artificial flavors. The Natural Dentist products contain no artificial sweeteners, dyes, preservatives or flavors. However, The Natural Dentist products do contain sodium fluoride, which is a natural fluoride (from fluoride ore) and is accepted by the American Dental Association for cavity prevention. If you use The Natural Dentist products, you can brush your teeth and rinse your mouth with natural fluoride. 1. Daily care. The key to dental health is a daily routine of brush, floss and rinse. The American Dental Association recommends that you do all three. 3. Schedule regular dental exams. Dental visits are typically right up there with public speaking on the list of things people try to avoid. You might be able to dodge the podium, but regular dental visits are essential. “If you avoid check-ups because you don’t love your dentist, it’s OK to switch,” Rosenzweig says. Ask friends and family for a recommendation. And if fear is what keeps you out of the chair, there are options. 4. Think of your dental hygienist as your dental personal trainer. Rosenzweig says, “The dental hygienist is the person on your dental team who gives advice about taking care of your teeth at home. When she cleans your teeth, she sees the whole ‘hit and miss’ story of what you have been doing between visits. Ask for advice and tips.” And aside from you, there is no one who knows your mouth better and is as invested in helping you have excellent dental health and a brilliant smile. Do you know what your smile says about you? If you have ever wondered what your smile says about you, wonder no more. The Natural Dentist has teamed up with renowned body language expert Patti Wood, also known as The Body Language Lady, to analyze your smile. The Smile Personality Analysis allows you to upload a photo (depicting your natural smile) to determine your personality. You may be The Analyzer, The Driver, The Influencer, or The Supporter – only your smile knows for sure! Can you over-whiten your teeth?